All text in Grid can be localized using the ej.Grid.Locale object. Please find the table with list of properties and its value in locale object. DeleteOperationAlert No records selected for delete operation. EditOperationAlert No records selected for edit operation. ForeignKeyAlert The updated value should be a valid foreign key value. FrozenColumnsViewAlert Frozen columns should be in grid view area. FrozenColumnsScrollAlert Enable allowScrolling while using frozen Columns. 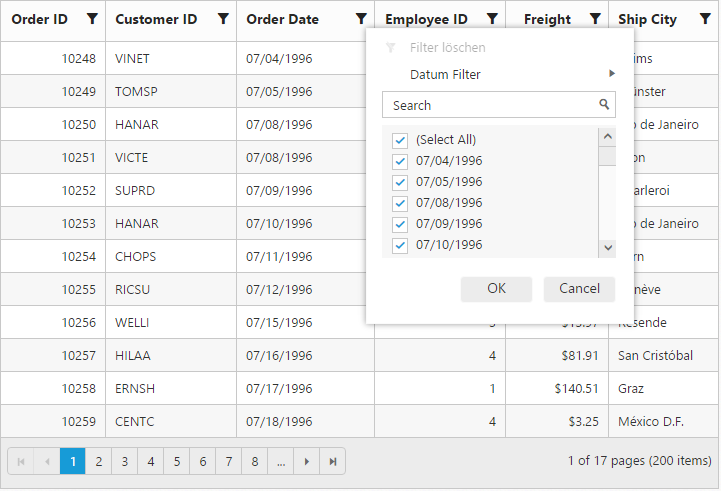 FrozenNotSupportedException Frozen Columns and Rows are not supported for Grouping, Row Template, Detail Template, Hierarchy Grid and Batch Editing. 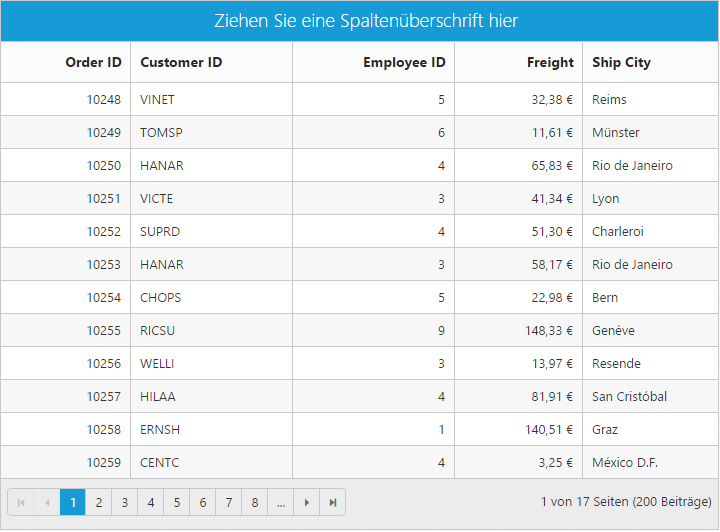 EmptyDataSource DataSource must not be empty at initial load since columns are generated from dataSource in AutoGenerate Column Grid. SortInAscendingOrder Sort In Ascending Order. SortInDescendingOrder Sort In Descending Order. Paging in Grid can also be localized using the ej.Pager.Locale object. Please find the table with list of properties and its value in locale object. You need to change pager locale in ej.Pager.Locale object. 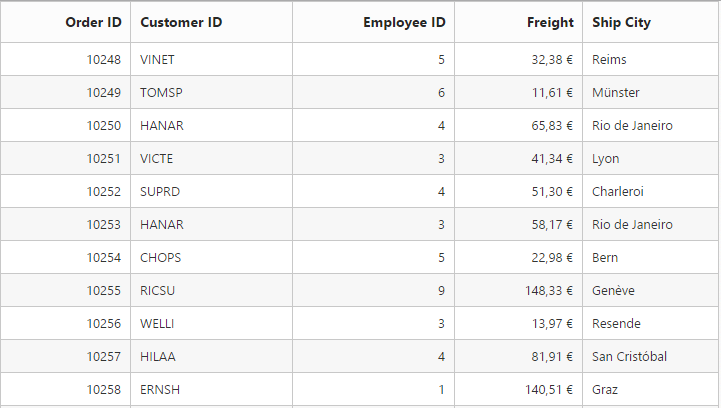 All text in Excel-Filter can be localized using the ej.ExcelFilter.Locale object. Please find the table with list of properties and its value in locale object. We have uploaded the predefined language packs for some commonly used cultures in this GitHub location. Refer to GitHub location for getting the predefined language packs for the corresponding culture. The culture file has localized texts for all the Syncfusion controls. 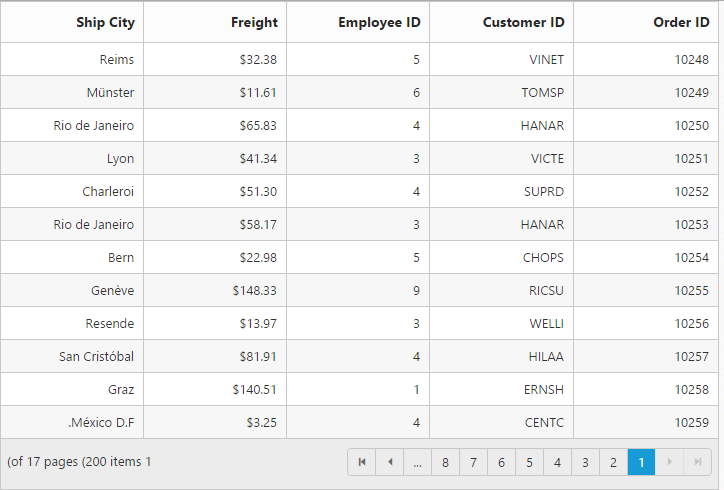 The ej.globalize library is used to globalize numeric values in Grid control using format property in columns. Globalize values will be automatically used when locale property is set with locale string value for example en-US. To translate our control content from default English to any of the culture, say For example - German language, then you need to refer the ej.culture.de-DE.min.js file in your application, after the reference of ej.web.all.min.js file. For all culture files, please download from the GitHub location. By default, Grid render its text and layout from left to right. To customize Grid’s direction, you can change direction from LTR to RTL by setting enableRTL as true.